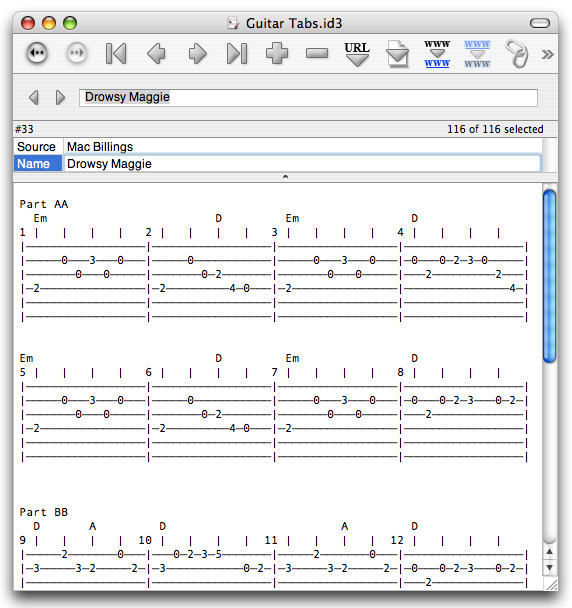 Click a song in the left-hand column to see the tablature. The tablature is in ASCII format, so you can save it and print it. I've written a brief explanation of how tablature works, for those who are not familiar with it. The center column has links for WAV versions of the songs, while the right-hand column has MP3 versions. I tend not to play anything exactly the same way twice, so there are mismatches between the songs as written and as played. This is due to lack of skill, rather than any deep philosophical reason. As far as I'm concerned, all the links from this page may be freely downloaded and distributed. Just be aware that some of the tunes are copyrighted, so they will require royalty payments if they are published for profit. I recorded the songs right at my desk, on my Macintosh. I'm very grateful to Greg Hyde of Assimilated Multimedia for his help in reducing the size of the sound files, increasing the volume, and generally cleaning them up. I've also posted a lot of tabs that were posted to the FLATPICK-L mail list. Those tabs do not have sound files.